I am Danny Brouillette and recently started working as a service climatologist at the Florida Climate Center (FCC), which is the office of the Florida State Climatologist, in Tallahassee. As you may already know, the FCC is a public-service unit within the Center for Ocean-Atmospheric Prediction Studies (COAPS), which is a research unit of the Florida State University. Born and raised in northern Illinois, I became fascinated by weather at a young age, simply because of the great variety of phenomena that are seen in the upper Midwest -- blizzards, thunderstorms, tornadoes, bitter cold, sultry heat, and so on. I'm particularly fond of snow -- I'm going to miss it here in Florida! In 2008, at age 17, I found out about CoCoRaHS and began observing in my backyard. After being graduated from high school in 2009, I enrolled in the meteorology program at Northern Illinois University, eventually earning my bachelor's degree in 2012. While I was a student there, I managed the National Weather Service CO-OP observation station located on the campus and served for a year as CoCoRaHS local coordinator for DeKalb County. In 2012, I moved to central Pennsylvania to begin graduate studies in meteorology at Penn State University, obtaining my master's degree in 2015. My research at Penn State involved the reconstruction of North America hydroclimate over the last 2000 years using proxy records. I am Ivetta Abramyan, a professor at Florida State College at Jacksonville (FSCJ). I teach various earth-science courses and serve as the co-chair of the Natural Sciences Council. I first aspired to become a meteorologist as I watched Hurricane Andrew batter the southern tip of my home state. I went on to earn a bachelor's degree in meteorology from Florida State University and a master's in marine science from the University of South Carolina with a focus on tropical climatology. During my time in Columbia, I was employed at the South Carolina State Climate Office, where I was involved in various aspects of CoCoRaHS, including data analysis, reports and publications, and outreach. In addition to teaching, I remain active in the scientific community by conducting research, working on collaborative projects, and staying involved in professional organizations, such as the American Meteorological Society and the National Weather Association. With that, if you have any questions, concerns, or ideas, feel free to contact us. We hope that you enjoy this month's newsletter and find it informative. Thank you for your observations! 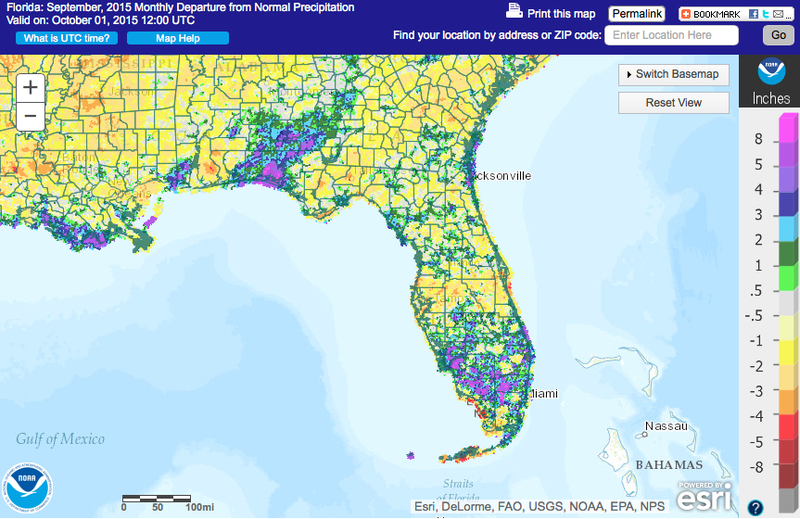 Your observations are crucial in a state like Florida, where weather is so diverse and fickle. As we know too well, it's not always the Sunshine State! We often see scenarios in which one part of a county, or even a single town, receives heavy rainfall as a thunderstorm passes over and another nearby part receives very little or even nothing because it is outside the path of that thunderstorm. These high-density observations are vital to our understanding of such highly variable rainfall patterns and provide benefits such as forecast verification, storm reports, historical data for research, and more. With that in mind, please do your best to submit reports every day -- even if no rain has fallen. "Zeroes" are data, too! From a scientific viewpoint, if zero rain has fallen, and you don't report that, that zero rain can't be assumed to have happened. Knowing that no rain has fallen is important because, if it happens at a location repeatedly over a period of time, drought becomes more and more likely, and meteorologists and climatologists are interested in monitoring drought because of its impacts on agriculture, society, and the environment. Additionally, if you go on vacation or otherwise can't observe for a few days, please complete a "Multi-Day Precipitation Report". Do you have questions or concerns or ideas? Do you have an interesting anecdote or story? Have a dazzling weather photo that you want to share? Feel free to send any of that to one of us! In future newsletters, we will feature observer photos. Speaking of future newsletters, for our part, we will look to send out a newsletter each month -- usually near the beginning of the month. 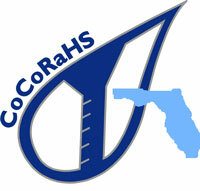 In the newsletters, we will present timely climate and weather data and information and news about the CoCoRaHS program. Observer comments are encouraged! Comments provide valuable context to observations, which can be very helpful to those who later use the observations. If nothing else, comments are interesting for us and other observers to read. We'll share some of your comments in this newsletter. Some of the more intriguing comments in June were related to Tropical Storm Colin, which brought heavy rains to central and northern parts of the peninsula and parts of the panhandle in the first week of the month, and to the spotty nature of rains, mainly driven by sea-breeze boundaries, later in the month. 6 June, Land O'Lakes 1.8SE, Pasco County (FL-PS-53): "Torrential rain from TS Colin began being felt late last night w/ a few quick-passing showers occurring overnight. As his ctr moved closer toward our Big Bend, his winds & rain bands became more frequent. Two outer bands crossed our location during the morning commute w/ the heavier squalls & sustained rain taking place during the mid-afternoon/early evening. Wind gusts reported @ TIA reached 41 while some other communities exceeded 50. Flooding took place at the Bayshore area via south Tampa ..."
7 June, Ormond Beach 3.5SE, Volusia County (FL-VL-5): " Periods of rain with embedded thunderstorms over the past 24 hours gave 1.45". I estimate our highest winds were 25-35 mph, mostly last night and this morning. At this location Colin was beneficial with much-needed rain." 7 June, Summerfield 3.0NE, Marion County (FL-MR-32): " Colin was kind to me giving me much needed rain without doing any damage." 7 June, Tampa 5.1S, Hillsborough County (FL-HB-10): " Tropical storm weather intensified overnight, with pounding storm rainfall and powerful gusty-howling winds that wouldn't end, daybreak brought stronger intermittent pounding rainfalls that have already created extensive yard and street flooding, early morning (8AM) brought a brief lull, yet 15 minutes later all of the above returned with vengeance at my South Tampa location today ..."
27 June, Tampa 5.0NNE, Hillsborough County (FL-HB-55): "Our first hard thunderstorm of the summer. An inch of rain in 20 minutes." 30 June, Green Cove Springs 6.8SSE, Clay County (FL-CY-19): "Total rainfall for June was 8.85", a deceptively high number since 7.1" came in 1 day, and 2 other days accounted for 0.96" total. We had long dry periods in between." Below are rainfall totals and their departure from 30-year normals for June 2016 for select locations across Florida. Data were compiled from the National Weather Service. Below is a contour map of total June rainfall based entirely on your CoCoRaHS observations. Map is courtesy of a utility in the Midwestern Regional Climate Center's cli-MATE browser. Current state of drought -- there isn't any! As of the end of June, drought was not present anywhere in Florida, according to the U.S. Drought Monitor (map shown below). For the last few months, 'abnormally dry' conditions had been present in at least a portion of the state. And, a year ago, moderate to severe drought was affecting parts of the state. Farmers across the state generally report seasonably good conditions for growing and harvesting their crops and raising livestock. As of 1 July, the water level in Lake Okeechobee was 14.93 ft., which is somewhat above normal for this time of year.